Submit a DataStax Enterprise (DSE) installation job to run on a cluster, datacenter, or node. An installation job completes the work of running a configuration job and by default, installing Java and the JCE Policy files required to enable unlimited strength encryption. Install jobs that expand an existing cluster are throttled to one node at a time to prevent too much data from streaming concurrently. Complete the following tasks before running any install jobs in Lifecycle Manager. For OpsCenter 6.0.0-6.0.x, 6.1.0-6.1.x, 6.5.0-6.5.3, and 6.7.0, the SSH server on target nodes must allow SFTP transfers. For OpsCenter 6.5.4-6.5.x, the SSH server on the target node must allow file transfer by either SCP or SFTP. LCM tries SFTP first and falls back to SCP. LCM does not create data directories or manage their permissions. See Creating custom data directories for steps to use a custom data directory. 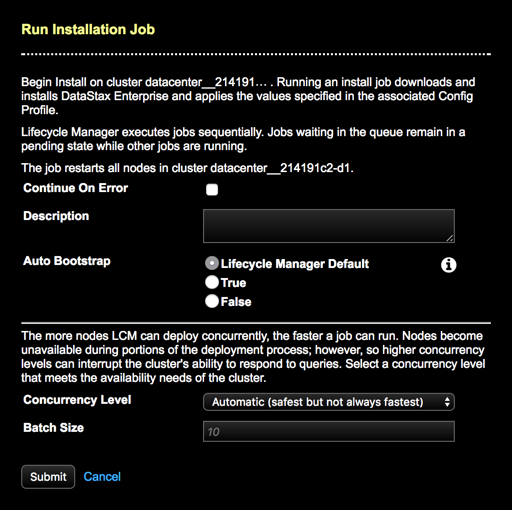 Select the cluster, datacenter, or node to run an install job on. Click Install from the drop menu. The Run Installation Job dialog displays. Select an option for Auto Bootstrap. To override the LCM default, choose True or False as required. LCM Default: Following best practices for data integrity, sets auto_bootstrap to True for new nodes, requiring new nodes to be started sequentially. The default job concurrency policy ensures that nodes start sequentially. This default is different from previous OpsCenter versions. True: Explicitly sets auto_bootstrap to True. False: Explicitly sets auto_bootstrap to False. For more information, see auto_bootstrap. If running an installation job on a cluster or datacenter, enter a Batch Size if the default (10) is not appropriate for your environment or the selected Concurrency Level setting. The batch size is a per job cap on concurrency that only becomes applicable when numerous nodes are eligible for a job run. Important: After the new datacenter has been added and the nodes are all online, you must change the replication strategy either manually with CQL (see ALTER KEYSPACE), or using OpsCenter. Run nodetool rebuild to propagate the datacenter with data. LCM does not perform those operations.